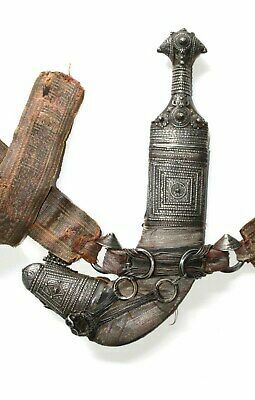 Seller: artribalart (627) 100%, Location: EUROPE, Ships to: Worldwide, Item: 333159955674 19th century exclusive antique OMAN Royal dagger You are bidding on a 19th century OMAN Royal dagger Precious Horn hilt grip with SILVER decoration! TOTAL length dagger = 36 cmLenght horn grip : 13 cm Used but very good condition !!! I only ship this item with track and trace !! LIVRAISON / SHIPPING : Belgique/België = 6 euro ; la France (colis recommandé)= 16 euro ;Luxembourg= 14 euro; Italy = 16 euro ; SPain = 18 euro. Europe = Shipping costs can be given on request for other european countries. USA= 40 euro (60 USD). Middle East : 100 USD. Il faut payer dans les 7 jours après la vente! Payments should be done within 7 days! Popularity - 39 views, 4.9 views per day, 8 days on eBay. High amount of views. 0 sold, 1 available. 39 views, 4.9 views per day, 8 days on eBay. High amount of views. 0 sold, 1 available.